Making good progress with the New Characters tests. There are a number of stages in the pipeline. Essentially what seems to be working is the skinning of mesh to a biped bone system within Max. The biped system is what the 3d exporter is most happiest with. It should be possible to create the mesh/bone structure in any app so long as the naming conventions and the joints, match what Max does. (very important!) BTW There is documentation from Antics on this, so if someone wants to rig up a character following those guidelines I could put it through Max for you. 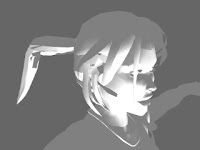 So here are some images from Antics, I am learning heaps with this project, take the grey ponytail girl, when you create a biped bone system within max you can set extra bones, for example a ponytail. This is of interest to me, not only because it means one could adjust the ponytail, but I am thinking one could rig up a character so the bones affect the facial mesh. Sort of a cheat way to get some posable facial expressions. If successfull then these characters would be compatible with all versions of antics. These other pics show a much denser poly count. Antics will allow a mesh up to 64,000 approx, which is much higher than what is in the existing characters. (except the emotive ones). I would like to develop a character whose hands and feet and face are a much higher polycount. The comic face compares low/high poly counts. A higher poly count means more curves which makes the edges smoother. I am yet to solve the hair, eyelash and eyeball elements. 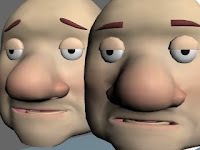 Another consideration for the facial expressions is to construct a face plate with various expressions and have the ability to swap out the entire head. (using a link to the original head joint!). It may be possible to build it just like a skull where the eyes and hair remain on the original character, so the join is disguised. Consideration is also being given to the texture maps for these characters.